Members of the band Stronghold — Ike Evans, Jim Writesel, Ann Rosenfeld and Mickey Rose have released their second album. Songs from the CD already are on more than a dozen radio stations nationwide. A Suffolk-based Christian band recently released its second album and has songs from the CD on more than a dozen radio stations throughout the country. Stronghold released the album, "Stop Running From God," earlier this month and also performed some songs from the album at Peanut Fest. "The concept of the CD was songs of instruction, songs of warning, songs of commitment," said Mickey Rose, who does lead vocals for the band. "The title cut is directed at the church because the churches are not doing their job. They’re making people feel comfortable, they’re trying to build their congregations up and they’re not preaching the whole character of God. He’s more than just love and caring. He’s all that, but He’s very wrathful, too." 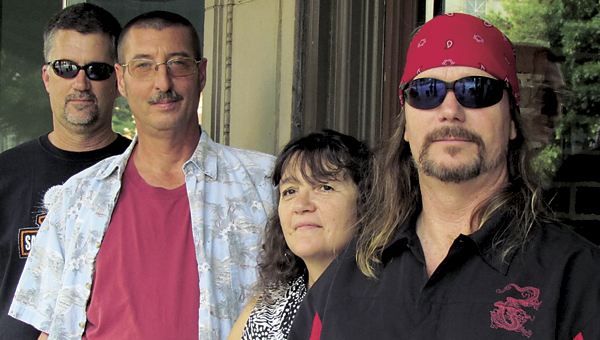 Stronghold has been together since 2002, and plays ‘80s rock-type Christian music. In addition to Rose, his wife, Ann, is the keyboardist and backup vocalist, Ike Evans is the bass player and Jim Writesel plays drums. While Rose said that "not every church and not every person in church is negligent," he feels that the majority are. "Christians are not standing up," he said. "That’s where the title cut comes from. It can apply to a nonbeliever, too." About 15 stations have picked up songs from the album, most thanks to three songs that were pre-released. "You have to find the correct format," he said. "We’re not going to fit into K-LOVE’s modern-day contemporary worship because [our] songs are very much like ‘80s rock." The group released its first CD, "A Cross and A Crown," in 2006. Since then, the group has played at numerous churches, coffee shops, festivals, biker events and more. "There’s a lot of stuff to do right here in our own backyard," Rose said, adding that he would like to be able to perform at Christian colleges. Stronghold fans can vote for the band’s songs at www.indieheaven.com, a website for independent Christian music. The site currently has a contest going on that could result in a publishing deal. "It’s kind of neat," Rose said. "We’re hoping to have three songs in the semifinals." People who want to get Stronghold's music can find it available for download at www.indieheaven.com or through the Stronghold website, www.strongholdband.org. A schedule of events the band has coming up also can be found on the website. Copies of the physical CD can be purchased at the Sears store on 571 E. Constance Road and 1317 Armory Dr. in Franklin.